Why hello! It's been a while... It's now become a regular thing for me to share a post and then disappear for a month with no reason. Aside from a full time job being my main priority and the fact that I am quite a lazy lady, I have to say that recently I have fallen a little out of love with my blog. I feel pretty stuck in a rut with my style, look and blog aesthetic (how are you not bored of my over the shoulder poses and Chelsea Embankment yet?!) - I suppose I just lost my inspiration and passion for a little while. As blogging is just a hobby to me, it means that I don't have many qualms about posting so little, and because of that it means I also shouldn't be afraid of mixing things up a little, so be prepared for more lifestyle, home decor and snippets of my life, rather than just fancy outfit pictures - the content I like to think you were drawn to when I started my blog a few years ago. I so agree with the blogging being a hobby. As much as I love it, it can get a little tedious when you simply don't feel like sharing anything. But I do love your posts, and your photographs are always lovely. Really cute outfit and I love your shoot locations. I love this outfit! I completely get what you mean about blogging - and it's great that you feel comfortable enough to only post when you're freally feeling it. That way your posts are always so genuine and heartfelt. And you are just too gorgeous! Love the shoes and those pants! That fit of trousers looks so amazing on you! 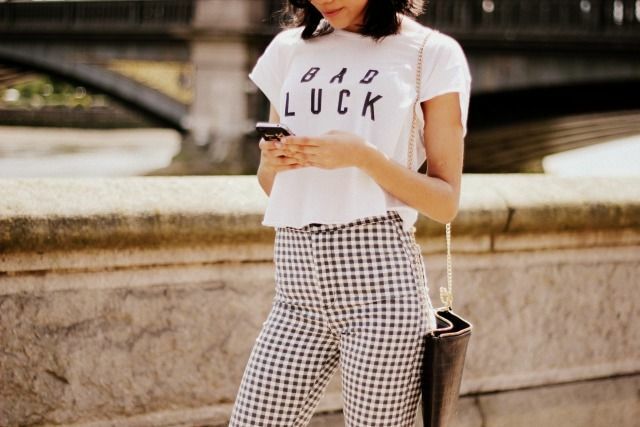 Love how you've matched those gingham pants, so gorgeous and cool! Stunning! Those jeans are amaaaazing on you. Looking forward to seeing more posts that you feel passionate about. Be fearless, whatever you do will be amazing, even more so if it' something you want to do! And your legs are gorgeous, wauw! I really like the outfit and always like your photos. I know what you mean about not being altogether happy with the blog thing, though. I have been wondering about mine for a while now but I'm not sure what I want from it. You have SUCH a stunning figure, those jeans are made for you! wow i love this look! you always have the best pictures! Legs for days! Loving the trousers. Love these jeans sooo much! Awesome vision, you look amazing in these jeans! I really love this outfit. I will copycat for sure!